The eastern imperial eagle, Aquila heliaca is classified as Vulnerable and decreasing by BirdLife International. Eastern Georgia’s steppes form an important breeding and wintering site, holding an estimated 35-50 breeding pairs. The population appears to be limited by a lack of nesting sites linked to the destruction of forest patches. Several electric pylons in deforested but prey-rich areas were used for nesting, showing the need for nesting sites. Other pylons in deforested areas are not suitable for nesting as they do not have any platform on top. The aim of the project is to install five platforms in strategically located pylons and assess their use by imperial eagles in order to increase the number of platforms in the immediate future if they are successful. 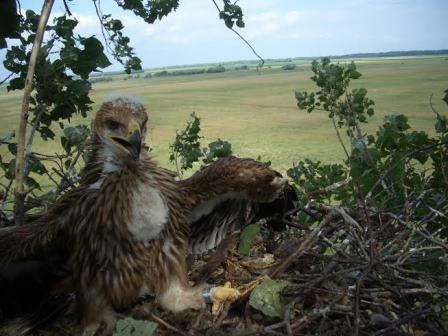 Derived outcomes during the season will be the involvement of locals in monitoring in order to avoid nest disturbance and/or robbing as well as awareness raising among children and authorities. The results of the success of the project will be the improvement of awareness about the value of the species in the area. As platforms do not solve the deforestation problem, remaining forested patches will be assessed for their protection.